The Gilt Group is having another terrific sale on a high priced cosmetic. 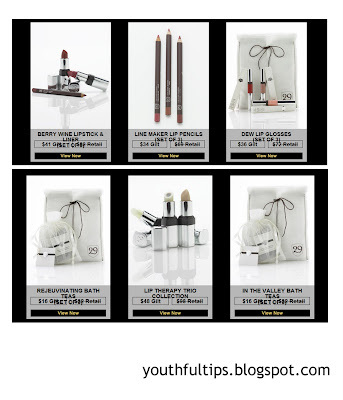 There are 19 different 29 Cosmetic products on sale at unbelievable prices until midnight, August 29, 2009. You can also get 29 Cosmetic at Neiman Marcus but not at this price. Lydia Mondavi is behind 29 Cosmetic which refers to Route 29 in Napa Valley. The products are formulated with grape seed extract which is known for it's anti-oxidant properties. Lydia had previously created skin care products for spas worldwide. She eventually married Robert Mondavi (yes, of the Mondavi wines). The Gilt Group sells really nice, more expensive items at great prices. Most are usually 50% or more off of retail prices. I have routinely priced items before I purchase to ensure I really am getting a good deal and it's true. The one thing I found with some of these places is the delivery can take sometime so read the terms before purchasing.